Chris King, for years, has been synonymous with quality. Since 1976, Chris King has been making sealed bearing headsets. After such a long and successful period in the industry, Chris King is still innovating. 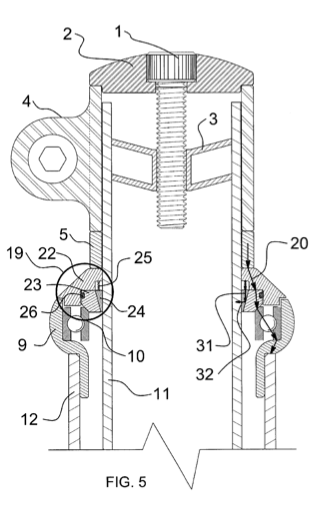 On March 4, 2014, US Patent 8,662,517 issued and is drawn to a headset that decouples the forces therein to preserve the structural integrity of carbon steerer tubes. At completion of installation, an axial force transmission path 20 is connected through the stacked components: 4, 5, 22, 23, 10, 9, and 12. Compression ring 24 and resilient element 25 are intentionally excluded from axial force transmission path 20. Therefore, forces 31 and 32 and the resulting gripping of compression ring 24 to steerer tube 11 are unaffected by changes in axial forces along axial force transmission path 20. Any added axial forces due to riding do not increase radial force 32. The magnitude of radial force 32 is dictated by the choice of resilient element 25 and geometry of compression ring 24. By design, radial force 32 is decoupled from the influence of added axial forces after installation is complete. There, the axial force transmission path 20 transfers force between the stem 4 and the fork (not shown in FIG. 5) via the head tube 12. However, the radial force 32, or compression on the steerer tube, is separate from the axial forces of path 20. Assignee: King Cycle Group, Inc.